Paltalk allows you to video chat, send IMs and join chat rooms with anyone in the world for free. Browse or search thousands of Free Chat rooms, or create your own. Paltalk works with AIM, Yahoo! and ICQ so you can chat with all your buddies using a single program. And with SuperIM from Paltalk, you can webcam chat - up to 10 people at once with rich video, audio and text. Now any PC or Mac user with internet access and a Web Browser can join it. ChatRooms, Instant Messaging & Video Chat a All in One. Oh, and it's FREE! ...... Now any PC or Mac user with internet access and a Web Browser can join Paltalk even if they have never downloaded video chat software of any kind before. * Free SuperIM - voice and video chat for up to 10 people simultaneously. 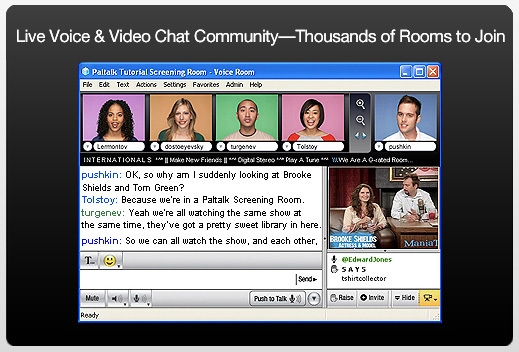 * Free chat room - Every member within Paltalk is able to create their own chat room and invite anyone to join them. Top room categories include politics, karaoke, sports and religion. * A Bot-Free and Friendly Environment Paltalk is a place for real people to connect in a friendly, trusted environment. Utilizing proprietary technology, Paltalk has created a "no-bot zone," free of chatterbots or virtual chat partners. NetChat is a local network messaging and communications system for Windows. This messaging server allows you to use MSN Messenger as an intranet messenger. Download this Full featured MSN style chat program specifically for singles. It totally hides any folder from all other users and programs. Qweas is providing links to PalTalk 10.0 as a courtesy, and makes no representations regarding PalTalk or any other applications or any information related thereto. Any questions, complaints or claims regarding this application PalTalk 10.0 must be directed to the appropriate software vendor. You may click the publisher link of PalTalk on the top of this page to get more details about the vendor.